All throughout the four gospels we see instances of Jesus doing divine acts of healing. Some of His miraculous accounts are recorded for us several times, told from different vantage point in the different gospels. Yet there are other miracles recorded for us only once, unique to the gospel which contains it. Within the gospel of Mark we find one of these unique miracles recorded in detail. The account of Jesus healing the blind man outside the village of Bethsaida is not only rare because it is only written about once, but it is also the only progressive miracle Jesus performed in the New Testament. We will explore this miracle more by examining each verse in Mark containing this account. Bethsaida was a village located near the mouth of the upper Jordan River on the east bank of the Sea of Galilee. This village is no longer inhabited but archaeologists have discovered its ruins and verified that it did exist at the time of Christ. As Jesus went through His upper Galilean ministry, He would have visited this village and been welcomed with the excitement of the people as they longed to see Jesus perform a miracle. The people may not have known or believed that Jesus was the Messiah, yet they would’ve heard of His great miracles and desired to witness them firsthand. It is recorded in this account that “some people brought a blind man and begged Jesus to touch him.” The people could have been bringing the blind man to Jesus because he was a part of their village and they cared for his well-being. On the other hand they could have simply desired to see the miracles of Jesus for themselves; they were looking for anyone to be healed so they could witness firsthand Christ’s miraculous power. No matter their motive, they had confidence that Jesus would be able to do a great work for this man. We can also safely assume that the blind man did not make his way to Jesus by himself or on his own volition. This could have been because he could not see, or because he lacked the faith to believe that Jesus could actually do anything for him. If that is indeed true, it could be for that reason alone that Christ chose to do the miracle in a progressive manner, which will be explained more in a moment. Before we proceed, we must acknowledge the spiritual lesson hidden within this initial verse. Here we find encouragement for all of those who are weak in faith. Like the blind man, there will be moments in our life when we will find ourselves spiritually hurting or in need of healing. We may lack the faith to believe that Jesus can do anything for us, so we question, “why would he care for me?” Similar to the blind man, we often need the help of those around us to carry us to the Savior through prayer and faith. Our faith is not always strong enough to get us to Christ on our own, but through the encouragement and faithful pursuit of other Christians, we can find ourselves at the feet of Christ ready to receive His healing touch. When we are weak, He is strong and will renew our faith to believe in Him again (2 Corinthians 12:9-10). The first part of this verse can be viewed as an intimate act of love before the miracle happens. Jesus did not choose to do the healing with everyone around, but instead He took the man alone with Him outside of the busy village. Jesus did not have to do this, nor did he have to touch him at all. He could’ve simply spoken a word right there in the middle of the bustling crowd and the man would’ve been healed. However, Jesus chose to tend to this man in a very caring way. Jesus, being divine in his nature, perhaps already knew that the man lacked faith. In compassion and love, Jesus “led him outside the village.” We are not told if anyone followed, or if the disciples were near, but what is important to note is that Jesus intentionally sought to be alone with this man. Some of the greatest and most faith-growing times in our life will happen when we are completely alone with God. The world we live in is full of busyness and distraction. When we are willing to be “led” by Jesus to a place of solitude, He will impress Himself upon us in ways He may not have been able to within the confines of our busy life. We see in this story that Jesus lead this man gently where he would not have gone on his own. In the same way, we must be willing to follow Jesus to special places of solitude for spiritual renewal. We cannot fight it or find excuses. Even today, when He grips our soul, we must trust Him to lead us to a place that is good for us, even though we may not understand its benefit at the time. The second part of this verse is small but an important part of the event; Jesus spat right into the man’s eyes. He could have healed this man without spitting because we’ve read about Him doing miracles without this action. However it was included as a seemingly necessary part of Jesus’ calculated process to (1) taking them outside the village, (2) spit on his eyes, and (3) then touch Him. So we’re left to ask, what was the reason for the spit? Most commentators agree that the warmth of Jesus saliva would have soothed the man’s pain. As we will see in the following verses, the blind man knew the difference between people and trees. That fact he was able to make this distinction allows us to safely assume that he had seen previously and was not born blind. Therefore, something may have caused him to go blind leaving open wounds on his eyes. Saliva may have simply been another act of compassion from Christ. 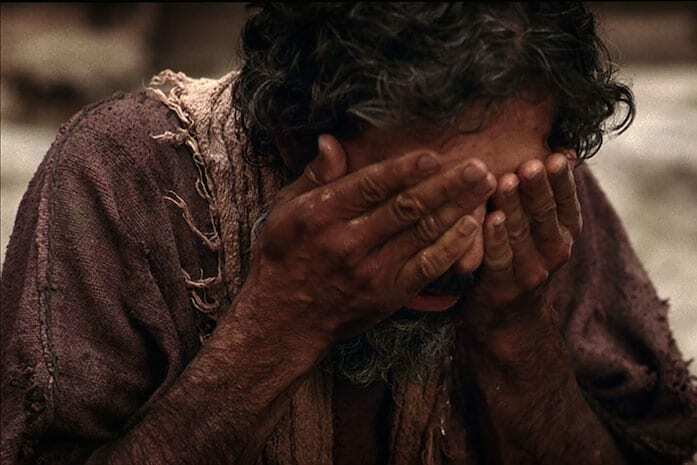 This action for the blind man may have helped him begin to have faith that Jesus could actually heal him because he felt the care of this miracle worker. While we may not be able to prove that the man had a preexisting painful condition directly from the text, it would make sense that Jesus compassion would have propelled Him to care for the man’s pain prior to the healing. In the same way, we understand that our God is not only one who sympathizes with us but moves to action in a caring way to tend to our hurts in an effort to grow our faith. He often is faithful to soothe the throbbing aches of our soul as He moves us to a place of restoration and completion. At the end of verse 23, we see the miracle take place. Jesus touched the man’s eyes and asked him, “Do you see anything?” With this question, we see the unfolding of the only progressive miracle recorded for us in the Bible. In every other instance of Christ’s miraculous power, we see His efforts accomplish the miracle upon His first effort. However, Christ’s touch in this instance did not fully heal the eyes of the blind man. Let us examine this further by looking at verse 24. All of Jesus actions, especially surrounding the accounts His miracles, were intentional and had purpose. We must not assume that Jesus messed up the first time when touching this man and that he was not able to heal him completely. Jesus never makes mistakes. Jesus was not at fault for not completing the miracle with one touch. Rather, there was a need for Jesus to do this miracle partially with the first touch and then completely with a second. The progressive nature of this miracle has most scholars interpreting a lack of faith on behalf of the blind man. The reason for the progression was to grow the faith of the one being healed. Here again we see an instance of Jesus compassion as He adapted his miraculous work to grow the man in his belief as the miracle was progressively accomplished. Not only was the man taken to be alone with Christ, but potentially his wounds would have also been soothed and then the miracle was accomplished in two steps. This pattern allowed the man to accept the fact that he was being cared for by someone who knew him intimately and grew his faith patiently. Jesus was not just a miracle worker, but a Savior and Lord who was restoring his sight and spiritually touched his heart. Jesus helped him step across the line from unbelief to belief. Within this verse the final saving touch of our Savior is captured. The compassion of the divine God was expressed through the fingertips of Jesus as he touched the man a second time. The blind man, most likely already filled with excitement because he could at least see something after the first touch, may have thought that the miracle was over. However, Jesus being perfect was only satisfied with perfection and completion. Jesus was not tied to a system or method for all of his miracles. Being in the very nature of God, He was free to do according to His will whatever pleased Him. In this situation, His desire was to grow the man’s faith. We notice that it does not say the man could see “just all right” or “partially” after the second touch. Rather, it states that his sight was restored and “he saw everything clearly.” Jesus was truly the “author and perfector of faith” (Hebrews 12:3) for this man. Upon the conclusion of the healing this man, and in spite of the great joy that the blind man must have felt, Jesus instructed him not to return into the village. This may have been because of the crowds of people that were waiting inside the walls anxious to see the results. This would have brought an onslaught of requests of Christ once the people heard of Jesus power. Jesus wanted to keep the crowds from continually seeking Him as a mere miracle worker and not the true Messiah. Healing was not Christ’s main purpose for being on earth. He also wanted to teach and train in order to ultimately point the way to God. Jesus did not tell the healed man to never tell anyone, he just told him not to go and the village. Surely this man would have told his family and perhaps others along the course of his life. Over time people heard of this event, and as we can see today, it was recorded in the New Testament for everyone to read for centuries later. But in the moment, Jesus was simply asking for obedience by instructing the man not to return to the village. In the end, how joyous it must’ve been he could walk away and see everything clearly. In conclusion there is a lot we can learn from this divine incident. Overall we can trust that God is aware of the state of our faith and what needs to be done to cause it to grow. He desires to take us to places of solitude with Him that we may otherwise avoid. Whether in solitude or in community, we must be open to His pursuit of our souls through the presence of the Holy Spirit so that our relationship with Him may grow in understanding. It is often in the sweet communion with our Savior that we experience fully His healing touch. Also, we are reminded by this account that Jesus knows our hurts and meets us where we are at, in order to take us to a place of complete redemption. He will not stretch our faith more than we can handle, but will tend to our wounds as He reveals more of Himself to us. Through the instance of the blind man being healed at Bethsaida we are given a sweet account of how Jesus opens the eyes of our hearts so that we can see Him more clearly.